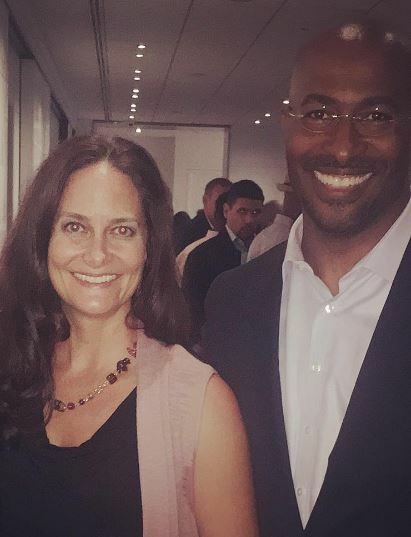 Van Jones (born September 20, 1968) globally recognized as an American political activist, commentator, author, and attorney also a native of Tennessee is an award-winning pioneer in human rights and clean energy economy is happily married to his lover of his life Jana carter. Jones is the co-founder and president of a non-profit organization called the Dream corps along with that he is also the author of two New York Times bestselling book, The Green Collar Economy and Rebuild the Dream. Besides this, he has also founded and led several social enterprises engaged in social and environmental justice. He even served as former President Barrack Obama’s special advisor for Green Jobs. Now he is currently working as a regular CNN contributor. Let's find out about his marriage now. Jana and Jones are not into sharing their personal life due to that the information about their marriage hasn't been shared in any of the social sites. But we have come to know that they have been married for a long time now. Its a photograph of Jana and Jones together. Since, Jones and especially Carter, they don’t seem to enjoy the spotlight. Carter in her twitter account has nothing about her husband or career. But is seen sharing the positive posts praising her husband which proves she is very supportive and is his number one fan. Jana Michelle Carter is one of six children born to Billy Carter and wife Sybil Spires. Her father was the younger brother of former US president Jimmy Carter which makes Jane the niece of the 39th president of USA. Jana worked as the director of Search for Common Ground’s USA Racial Healing program and is also a board member of The Garden Church. The couple has two sons Mattai and Cabral who are around 8 and 12 years old. They seem to be a happy family as seen in one of the photos Jones posted in 2008 on his Facebook page. It shows a glimpse of his wife and two children. Here check out the photograph of their family. In 2009 Jones shared information about his wife to Oakland magazine describing her as a power tool kind of girl and very independent. He added that she isn’t the one to wait for him to do the plumbing and is very resourceful. Hence from the statement, it can be assumed that the pair gets along very well and are living a very happily married life. Jones who has been an inspiration to many, despite his fame he managed to separate his personal life with his professional life. Maybe that could be the reason for the success of a long lasting relationship. In an era where marriage has become so superficial, Jones and Carter have managed to co-exist together, showing others how it should be done. Now, Jones and his wife Carter are currently residing in California with their two sons.